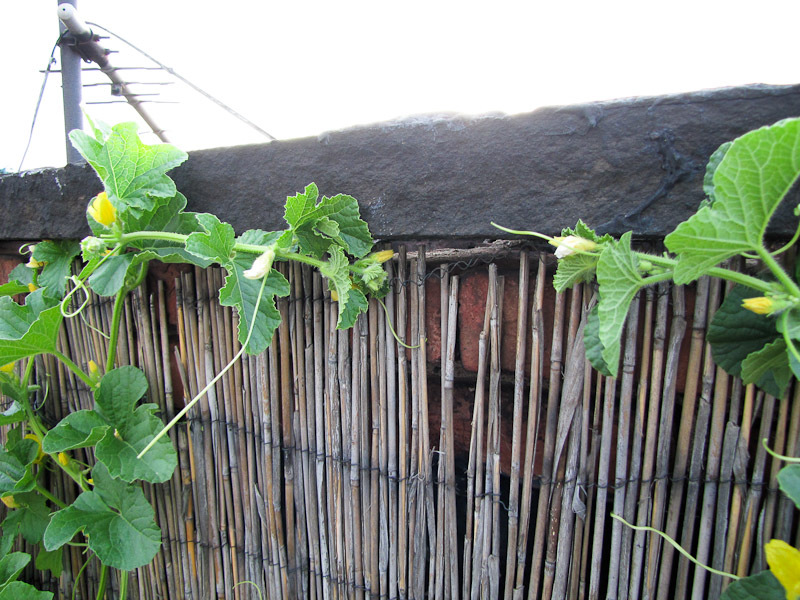 I don't want to get too excited in case I'm wrong, but I think some female flowers on the melon plants have finally been pollinated. In the above photo the female flower did not get pollinated. 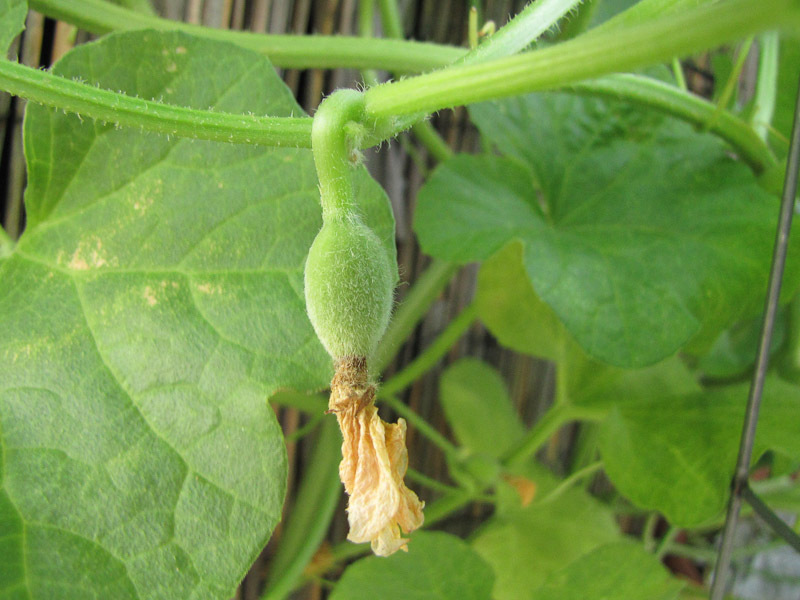 The flower shriveled up and turned brown and the tiny fruit behind it shrank in size and turned yellow. In the above photo the flower has also shriveled up and turned brown, but note the difference in the fruit, it's still green. Also, now it's hanging down, as if it has gotten heavier. Before the flower was angled up, reaching toward the sun. I've seen several flowers like this in the past few days. I hope it means what I think it means, I'm tired of angsting over a plant! Some of the vines are topping the chimney so now I'm training them to grow sideways and down. 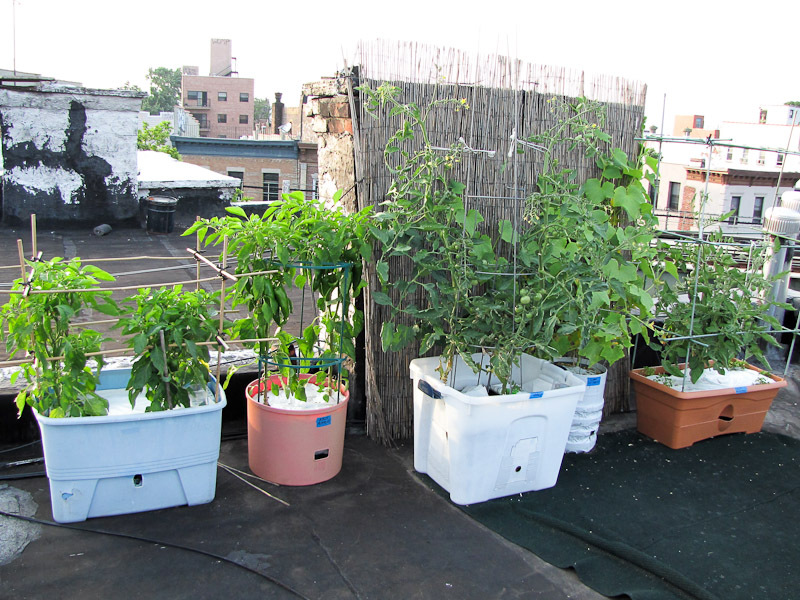 I thought for sure the cherry tomatoes would be the first thing to ripen on the rooftop, but they're still green. 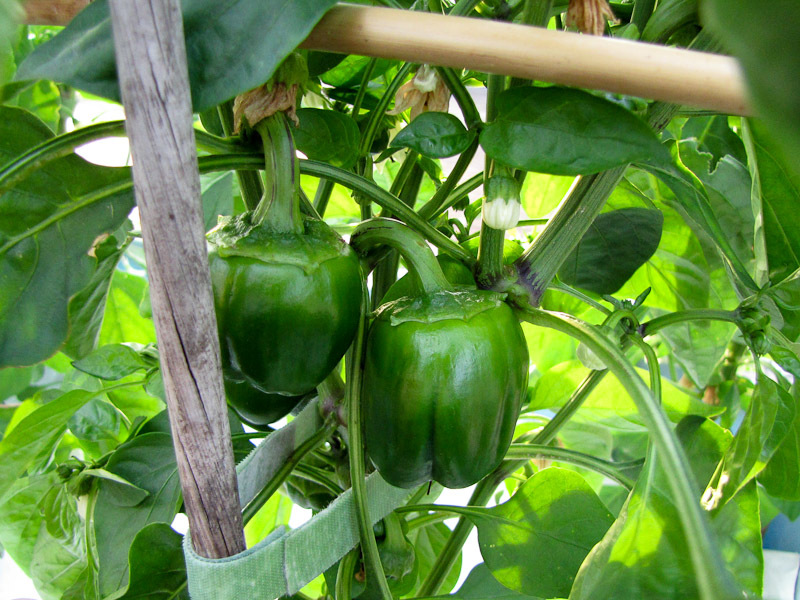 Young fruit on the King Crimson pepper plants. The Yellow Perfection tomatoes are changing color. 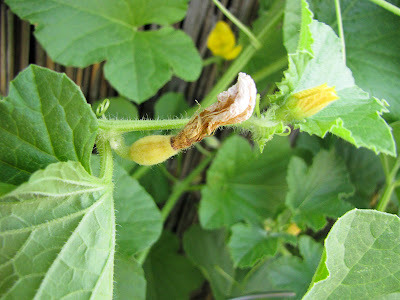 Powdery mildew is steadily creeping up the Lemon cucumber. Organic fungicide is slowing down the process so hopefully a few cukes will make it to maturity before the plant dies. 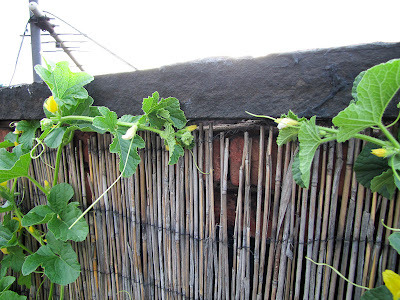 Maybe I'm just not meant to grow cukes. 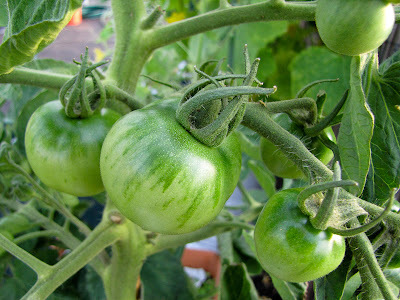 The first year I grew them, 2008, the plant died of powdery mildew before I knew what was going on. The second year the seeds never sprouted, not a single one, and I used the entire packet. 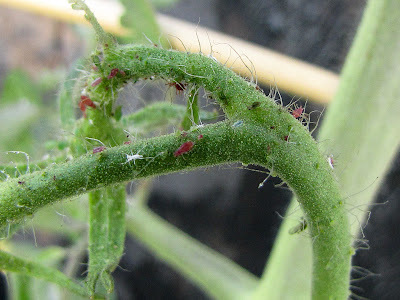 Last year they struggled through spider mites, but ultimately were finished off by a tornado. Now we're back to powdery mildew. I'm taking a break. 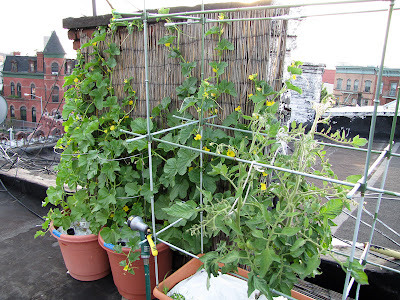 Next year no cucumbers for the rooftop. 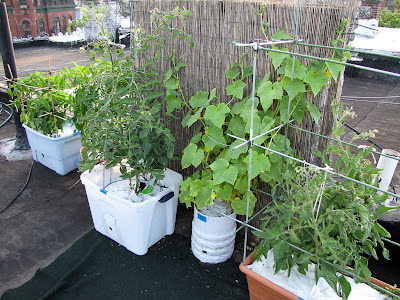 Aphids have found the Valencia tomatoes so every now and then I shower the plants in water to reduce their numbers. 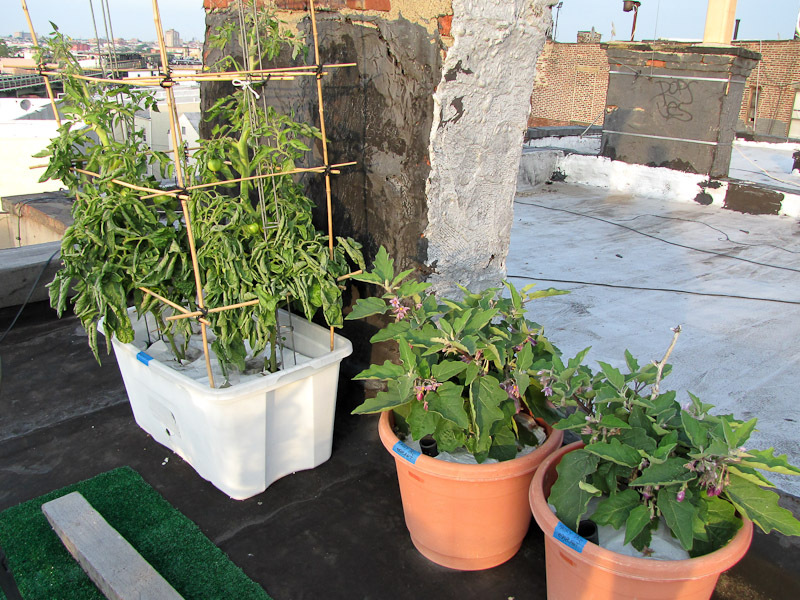 Fairy Tale eggplants are the first harvest from the roof. The fruit is tender, seedless and never bitter. The skin is a beautiful lavender with white streaks, very eye-catching. Just watch out for those thorns! I always end up pricking myself because I forget they're there. These are just as good as the ones I grew last year, Gretel, so I'll add it to my list for top vegetable seeds for rooftop container gardening. 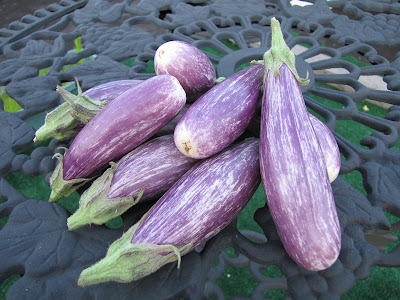 Wow - I can't get over those EGGPLANTS!!! They're just gorgeous. My plants are still growing but not even a flower yet! I'm hoping to get at least a few eggplants by the summer's end. Your melon vines look great! Here's hoping more of the flowers were pollinated. Bummer about the powdery mildew. 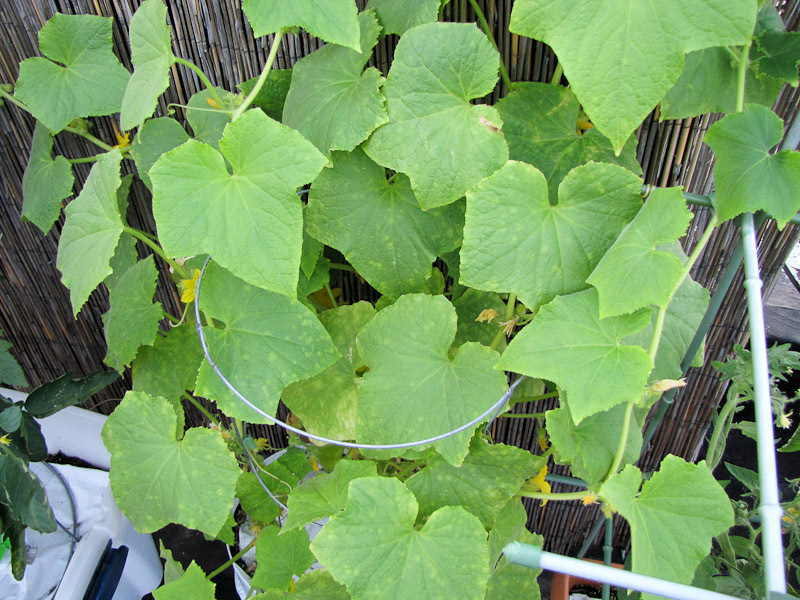 Cucumbers seem to be giving you grief every year, huh? 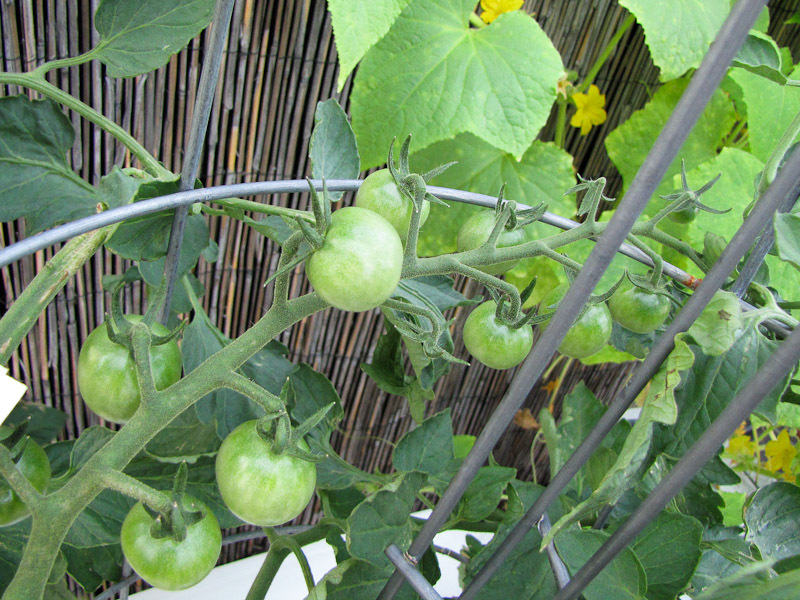 We just had the first few SunGold cherry tomatoes turn orange on the plant you gave me! I'm so psyched! They need another few days before being fully ripe, but it's starting! Hi Aimee, let us know how those Sungold cherries taste when they're ready. Have a good July 4th! Whooooooooooooooa. Fairy Tale Eggplants have thorns?! Thanks for being the bearer of bad news there! I will have to keep my eyes out for those. My FT Eggplan currently has about a half-dozen fruits on it, but I haven't seen any prickees yet! Hi Ben, yup not a lot, but enough to sting. I'll post a pic in the next garden update. Wow, your eggplant looks amazing! The eggplant plant you gave me is still growing. As of yet, not flowers. It has been fighting the good fight with bugs eating it's leaves. I'm hoping to get at least one eggplant! BTW, I harvested 4 sungold tomatoes from the plant you gave me, and oh my goodness, they are delicious! I definitely have to grow them again next year! Hi Mimi, if you think the 1st harvest is tasty just wait till get another. Hope you get the some eggplants before the bugs do!